Thanks in no small part to Polamalu, Taylor played in three Super Bowls and won two of them. And Taylor probably had a bit of an easier time guarding some receivers because not many relished the idea of going across the middle with Polamalu patrolling that part of the field. But there wasn’t much individual glory for Taylor — he was never once voted to a Pro Bowl — and fans who don’t just forget about his career may only remember him as a guy who played with Troy Polamalu. But sometimes, there is a tandem of teammates in the defensive backfield who draw a double serving of individual accolades and recognition. In his five-year career, Peterson’s been an All-Pro as a corner and kick returner. He’s a premier returner and has the potential to become a true shutdown corner. After getting his health in check, Peterson was a great asset for the Arizona secondary and one of its leaders. His versatility and ability to play multiple positions will always make him valued. He’s another versatile DB, and there’s a reason he has the nickname “Honey Badger”: He’s a nightmare for opposing offenses as a true playmaker and ballhawk, with five picks and 17 passes defensed in 14 games last season. The 5-foot-9, 186-pound safety plays with passion and a fierce edge. 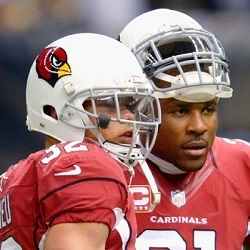 When Mathieu went down with a torn ACL at the end of the 2015 regular season, the Cardinals’ defense lost its attitude. Defense is all about attitude, and if he would’ve played in the playoffs, it would’ve been a different story for Arizona. If Mathieu can get healthy and stay healthy going forward, he’s going to have a Troy Polamalu-caliber career, with what he can do and the passion he plays with. Some might question this choice, but there is rationale to my decision. With the spotlight on Aqib Talib and Chris Harris Jr., who led the Broncos’ secondary vocally and statistically, Roby was, without a doubt, the unsung hero of the “No Fly Zone.” The 23-year-old corner is the most versatile of the three, covering anyone from the opponent’s No. 1 receiver to the best slot receiver. He played a key role in Denver’s road to winning Super Bowl 50, and he’s only going to become more valuable to this team in his third NFL season. Sherman has proven himself since the day he stepped into this league as a fifth-round pick in 2011. He’s very intelligent and his play reflects it. Some people questioned why he only played one side over his first four seasons, why he didn’t travel to cover his opponent’s top receiver. Well, he covered No. 1 receivers all over the place last season and did a helluva job in the process. On top of that, he’s improved his tackling and is a huge member of the Legion of Boom. He’s in his prime and isn’t satisfied, and I have to respect that. A few years ago, Revis was it. Quarterbacks wouldn’t even think about throwing the ball his way, and with good reason. Revis changed the game and opposing defenses avoided him — as they still do when they can. He’s been at the top of league at his position for years, and he continues to be a force to be reckoned with, even entering his 10th NFL season. Injuries have hindered his play some, which is why he’s at No. 5 on this list, but he was still tied for sixth in INTs (five) last season. The Kansas City Chiefs had a pair of DBs on Taylor’s list of honorable mentions: cornerback Marcus Peters (the reigning AP Defensive Rookie of the Year) and safety Eric Berry. They were joined by Panthers CB Josh Norman, Steelers CB William Gay and Chargers CB Jason Verrett.